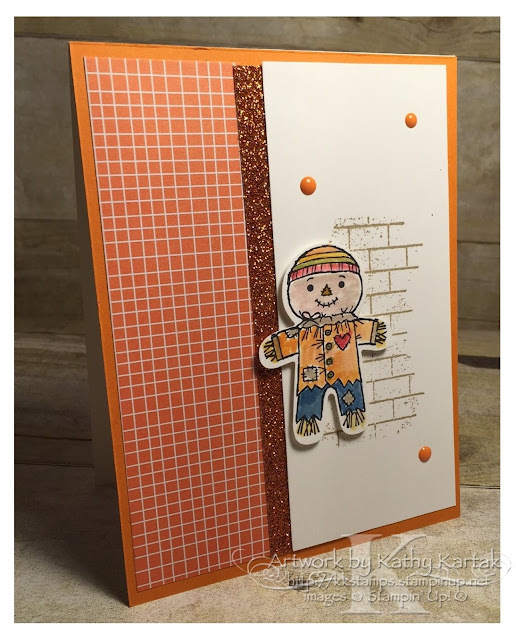 #stampinup #faithfulinkspirations If you've been following my blog, you know I'm head over heels in love with Stampin' Up's "Cookie Cutter Halloween" stamp set! There are four adorable images in the set and I've been using the mummy and skeleton a lot, so I'm glad that we used another image from this set at my group's Holiday Catalog gathering. I also love that there are other "accessory" stamps in the set--like a trick-or-treat bag, bat, bird, and more! This card is super cute and super easy to make. Here's how we did it. We stamped the sweet scarecrow image in Basic Black Archival Ink onto a piece of Whisper White Card Stock and punched him out with the matching Cookie Cutter Builder Punch. We colored the scarecrow with Stampin' Write Markers: Pumpkin Pie, So Saffron, Real Red, Crumb Cake, Smoky Slate, and Dapper Denim. Next, we stamped the brick wall image from the "Ghoulish Grunge" stamp set in Crumb Cake onto a Whisper White panel. We layered a strip of Pumpkin Pie Glimmer Paper and a strip of Pumpkin Pie Halloween Nights Specialty Series Paper onto the Whisper White panel before adhering everything to a Pumpkin Pie card base. We adhered the scarecrow to the card with Stampin' Dimensionals and added a few Pumpkin Pie Enamel Shapes to finish the card. This sweet scarecrow could be used for Halloween and throughout the fall! Don't you just love him? !